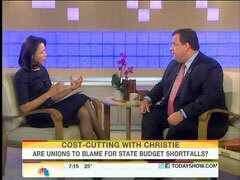 New Jersey Republican Governor Chris Christie stopped by the Today show, on Wednesday morning, to educate viewers and NBC's Ann Curry about the problems of public employee unions and explained that when it comes to getting government costs under control sometimes you just have to say no. Curry mostly questioned Christie from the left, as she asked if there was "a coordinated" GOP agenda to make unions "scapegoats" for a problem "created by Wall Street" and the "banks" and suggested that "in some ways it doesn't sort of make sense...that the unions really are to blame." For his part, Christie responded: "It's an issue of wanting to say yes all the time as a public official. You know you never want to say no to anybody because 'Oh you're much more popular if you say yes.' Well you know what? It's time we have to start saying no to certain things to be able to say yes to the things that will help to grow our economy and create a more prosperous future." Curry began her interview by citing the New York Times editorial page to the governor, as she asked if in states like New Jersey, Wisconsin, Ohio and Indiana there was "a coordinated Republican political agenda to this attack or this effort, this pointed effort at unions?" To which Christie pointed out government spending is so out of control that even Democrats like Governor Jerry Brown in California were being forced to make cuts. ANN CURRY: Chris Christie is the Republican governor of New Jersey and was the first, as we just heard, to take on public employees unions. Governor Christie, good morning to you. GOV. CHRIS CHRISTIE: Good morning, Ann. CURRY: You probably are the best person to ask about a New York Times editorial in this morning's papers that basically talks about a - says that there is a political agenda by Republican governors, not just from Wisconsin but also in Ohio and Indiana that in each case, quote, "Republican talk of balancing budgets is cover for the real purpose of gutting the political force of middle class state workers who are steady supporters of Democrats and pose a threat to a growing conservative agenda." Is there a coordinated Republican political agenda to this attack or this effort, this pointed effort at unions? CHRISTIE: No and, and if you look at it, these fights are going on all over the country, not just with Republicans but with Democrats. Look at California, Jerry Brown is talking about cutting their take home pay eight to 10 percent and laying off a bunch of state workers. This is about re-shifting our priorities. So if you want to do things in New Jersey, like I want to do, which is to provide property tax relief for middle class taxpayers. Well you know you can't continue to pay health benefits in New Jersey where this government pays 92 percent of the cost of health care for each person. That doesn't happen anywhere. And so we have to make these choices and they have to become part of the shared sacrifice. CURRY: Okay so then the idea then that some critics have, that you are making unions scapegoats for a problem that really wasn't created by unions but was really created by Wall Street, created by the banks and the downturn in the economy, what do you say to those critics? CHRISTIE: Well what I say to those critics are, they're not paying attention. Because if you were paying attention the problems here that are created on the state budget - sure we have a deficit problem that was helped by the economic downturn but what we also have are benefits and costs that are out of control. The family policy that most state workers in New Jersey get - $24,000 a year and they pay eight percent of that cost, the taxpayers pay the rest. We cannot afford these type of things any more. We have a pension deficit of $54 billion dollars in New Jersey. I mean that wasn't created by Wall Street. That was created by the fact that the benefits are too high and the payments in are too low. CURRY: But this problem, budget problem is not just with states with collective bargaining deals. For example, there are many states that have denied collective bargaining rights that also have very large budget deficits. So in some ways it doesn't sort of make sense, that this idea that the unions really are to blame. CHRISTIE: Oh I'm saying it's just about collective bargaining, Ann. Because even in states, as you point out, where collective bargaining doesn't exist, legislatures have been too generous to public employees over time. So it's not just an issue of collective bargaining. It's, it's an issue of wanting to say yes all the time as a public official. You know you never want to say no to anybody because "Oh you're much more popular if you say yes." Well you know what? It's time we have to start saying no to certain things to be able to say yes to the things that will help to grow our economy and create a more prosperous future.